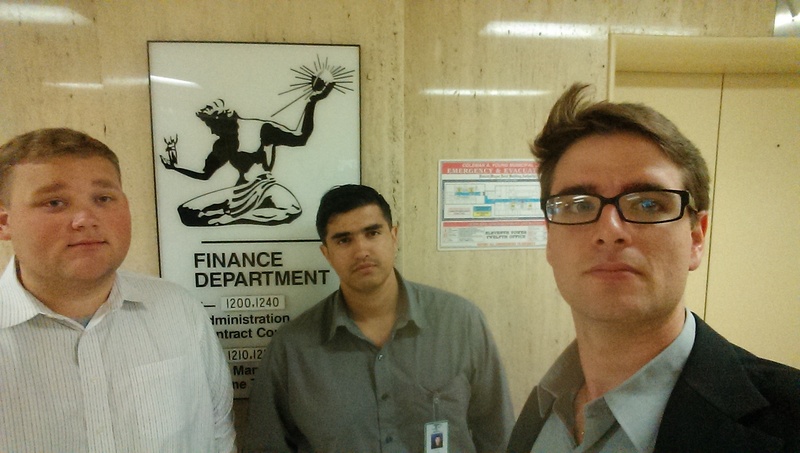 This summer, three of Michigan State Master of Public Policy program students have taken on the City of Detroit’s Finance Department, Income Tax division. Marcus Coffin, Juan Loaiza and Sean Tobin are working in the Economic Policy Planning and Strategy office under Deputy Mayor Carol O’Cleireacain. This office is responsible for overseeing numerous aspects of Detroit’s tax collection process, from identifying non-filers to processing returns and providing customer service. The project they have been working on is referred to as the Landlord-Tenant Project, in which they seek to identify city income tax non-filers in Greater Downtown Detroit with data obtained from the landlords and from the city’s tax software. This task involves a large amount of direct landlord contact and a huge data collection and cleaning operation. The goal is to develop a database that will give complete and accurate information in one place of residents that are subject to income tax and how to contact them. In finding the most effective method to do this each has played a part in offering new approaches. In particular Sean has had the opportunity to introduce and utilize his GIS skills to the current system to map income tax compliance in downtown neighborhoods over the past five years. The MPP students were part of the inaugural class of InnovateGov, a program developed by Assistant Professor of Political Science Josh Sapotichne and MSU Extension faculty member Eric Scorsone to help students gain real-world experience in local government while assisting urban governments with complex problems. Sapotichne and Scorsone, who lead an ongoing research project on municipal fiscal distress and state intervention, worked with students throughout the summer to help connect their academic work to their experience at the city. From the internship experience Marcus finds he has learned a great deal about how city bureaucracies function day-to-day. It has also taught him about how data is used in city government, and the importance of maintaining up-to-date data. When initially arriving in the city they were assigned to build a database from the ground up using data from disparate sources. Had their been a place where all of this data is collected and kept would have made the job far easier. Juan has also come to find the importance of cities collecting data at present in order to ease future operations, programs and facilitate the leadership decision-making. In addition Juan has learned how to identify solutions to problems involving large amounts and incomplete data. He hopes moving forward through work such as this, more effective methods will be adapted in the public sector and cut back on current inefficiencies. Through their time with the City of Detroit, Marcus, Juan and Sean have all come to gain a better understanding of bureaucratic operations and team building to accomplish set end goals. Their work is extremely important to the city and has come to be mutually beneficial.